Available in R-4, R-6, or R-8 fiberglass. Opening 1/2" oversized to accommodate return-air grille. Dual Bead box design for added strength. Available in 8" or 36" tall models. 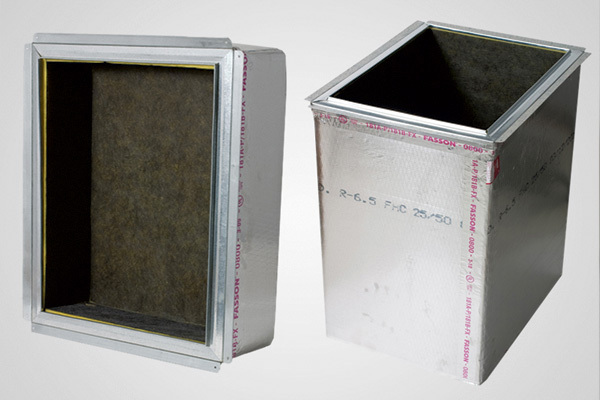 FGRAB8: Flanged all-fiberglass return-air box 8" tall. FGRAB36: Flanged all-fiberglass return-air box 36" tall. FGRABU8: Unflanged all-fiberglass return-air register box 8" tall. FGRABU36: Unflanged all-fiberglass return-air register box 36" tall.